Using a lead longer than 1.5-2 metres whereby you suffer from DC voltage drop-off. Low voltage DC power loss is why we use AC to supply mains electricity- you lose less on the way. Although theoretically the maximum length of a USB cable - or a chain of USB extension cables - is 5 metres (without a repeater adding extra power in along the way), that theoretical maximum is for data integrity, not for power. For power, especially at very low voltages such as USB's 5 volts, and especially for a device notoriously fussy about power such as the Raspberry Pi, keeping your cables short can really matter. I've been working my way through mains adapters and have finally found a selection that seem guaranteed to work with everything, and which are widely available. There is, however, a common problem with USB nano WiFi / wireless network adapters which is not to do with power supply, but to do with power saving - we'll come to that in a moment. It is widely available, with easily-identifiable branding and model number. It is cheap - typically £5. It supplies 1.2 amps - more than enough for an overlocked Raspberry Pi plus a couple of moderately power-hungry USB peripherals. It is sturdy and well built. For example it doesn't get too hot and the Micro USB plug is small and moulded rather than bulky and clipped-on. The cable is thick. Not just the rubber sheath, but the wire itself is thick. This reduces power loss. The performance is sufficiently powerful that you can connect a short 0.5-1.2 metre Micro USB extension cable (a couple of quid on eBay) and get a little more freedom before DC power drop-off gets low enough to trouble the Pi. 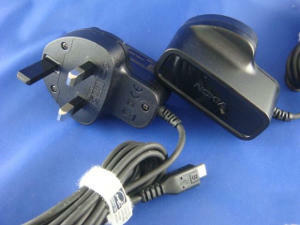 The model number for UK mains sockets is the AC-10X; for European sockets it is AC-10E; for North America it is AC-10U. However all of these models are mains multi-voltage and will accept 100-240V at 50-60Hz. 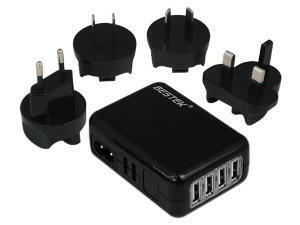 So you can take it abroad and use it with mains travel adaptors. Annoyingly, it is discontinued - but there is enough stock around the world to keep Raspberry Pi owners happy for the next couple of years at least. Its replacement model, the AC-60, is even higher ampage at 1.5 amps, but is currently much more expensive, and doesn't come with a cable. There are plenty of other suitable adaptors - the 1000mA one supplied by default by Farnell and the 1200mA one supplied by RS Components are both good - but in the aftermarket range, I think the Nokia AC-10X provides the best balance of availability, price, reliability and ampage. Widely available, but especially on eBay. Expect to pay £7-£15 depending how many international heads you get with it. You can buy them with a selection of international heads; for example I bought one with UK and European heads which means I don't need a mains socket convertor when I visit my sister in Holland. The heads connect to a Figure-8 socket, allowing you to discard the mains head and instead use a long Figure-8 mains lead (the kind used for kitchen radios - not supplied) to avoid DC voltage drop-off when you want to power a Pi far away from a mains socket, rather than using long USB cables. The power output of 2.1 amps can happily and reliably supply two Raspberry Pis with USB dongles, possibly even three if you're using Model As or if you're not using any power-hungry USB peripherals. These are manufactured under a variety of names, including Bestek, Dot.Foto, Artic Cooling, Kensington and most often described as "Universal". They are typically supplied with between one and four international mains plug heads, which clip into place over the Figure-8 socket and require a release button to be depressed to unclip them. Some have the USB sockets on the base (pointing down), others on the back (pointing perpendicular to the wall). Even after buying a powerful and reliable power supply, USB nano WiFi adaptors often fail to perform. They'll work fine on boot, but as soon as the network traffic dies down, they become unreliable. The problem here is that many of these nano adaptors use a power-saving mode designed for smartphones and tablets where the network traffic is typically predominantly outbound. If the Raspberry Pi doesn't send any network traffic for a while, the nano wireless adaptors go into low power mode and become difficult to contact from an external source. For example, you may not be able to ping or establish an SSH connection from your desktop PC to your Raspberry Pi, or an SSH session may become unreliable after being left idle for a few minutes. These power-saving modes can, and I believe on a Raspberry Pi always should, be turned off. The actual power saving is pretty minimal, especially if you actually want to have the Pi serving data pretty much constantly. Even when powering the Raspberry Pi from a battery (such as one of those mobile phone emergency power packs), I have found it far better to turn off the WiFi power saving. There's not a lot of point in my Raspberry Pi robot having a little extra battery life, if it spends three quarters of that time being uncontactable. What this does is add the instruction options 8192cu rtw_power_mgnt=0 to the file /etc/modprobe.d/8192cu.conf , plus a little comment reminding everyone what it's for; you could edit or create the file yourself in nano or vi if you prefer. Rebooting the Pi ( sudo shutdown -r now ) is a simple and effective way to bring the setting into effect. The setting will be remembered upon subsequent reboots. You can undo this setting by commenting out the options line in 8192cu.conf or, if you don't have any other settings you care about, deleting the file ( sudo rm /etc/modprobe.d/8192cu.conf ). Okay, so right at the start of this article, we talked about how a USB cable could be five metres long and still good for data, but not for power. My recommended solution is to bring your AC as close as possible to your Pi. You can do this either with a standard mains extension cable, or you can use a DC adaptor which has an AC socket, such as the 4-port USB travel adaptors with Figure-8 mains sockets I recommended above, which allow you to use potentially very long Figure-8 mains cables, the kind you might use with a kitchen radio or a hi-fi separates system. Failing that, get a good reliable mains adaptor that puts out at least 1000 milliamps (1 amp) and is slightly over the 5 volt output. The USB specification, and the Raspberry Pi specification, allows for up to 5.25 volts maximum and 4.75V minimum. The Nokia AC-10 I recommended above, gives out around 5.05-5.2v, so you can lose 0.3v and still be okay. I tried a number of different cables and found that a non-overclocked Raspberry Pi model B revision 2 performs acceptably with the Nokia AC-10x cable length of 1.8 metres plus a Micro USB extension cable of 1.2 metres. However with a less powerful/reliable power supply, 2 metres total cable length worked whereas 3 metres didn't (problems reading the SD card). So ideally you should keep your total USB DC power cable length to 2 metres or less, and if you must use a USB cable extension lead, you will almost always have problems above 3 metres total length, even with an ideal power supply. It is much, must better to extend your AC leads rather than your DC/USB leads. Of course, there is one final near-perfect solution to the cable length issue; use batteries. Most of the beefier mobile phone emergency chargers will do the job, provided they can provide enough amps. The cheaper mobile chargers will only supply 500mA. The Model A Raspberry Pi really does represent a significant power saving. Model B at idle with nothing attached uses 375mA; doing some number crunching it ups to 450mA. A nano USB WiFi dongle adds 100-200mA depending how far it is from the router. The official Pi camera adds at least 200mA. The Model A idles around 115mA and crunches numbers up around 160mA. Figures very approximate. Add at least 100mA if you are in a weak WiFi signal area or doing heavy processing. Add another 100mA if you are connecting a mouse, keyboard and display.